Extended/Triple range models at incredibly low prices! Save 30-40% on any comparable unit in the Market! 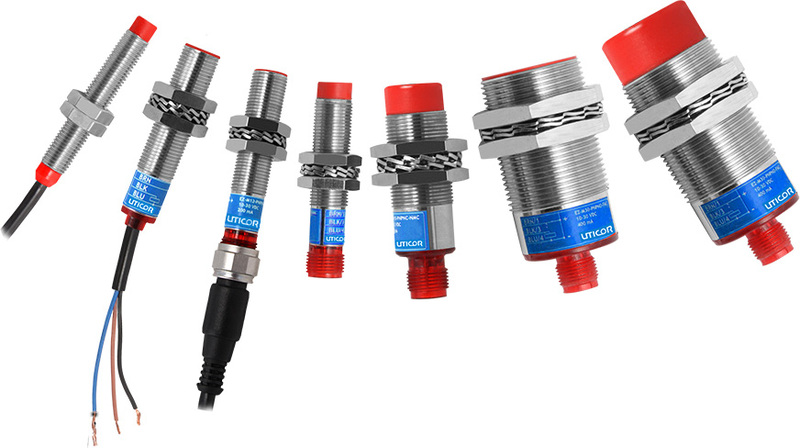 Uticor Proximity Switches are the lowest cost inductive proximity sensor on the market with great features and then some. It has a patent pending 360° Red LED visual light ring when output is ON providing a visual indicator when a metal object has been detected. It has a robust construction and the best electrical specifications like power supply voltage, load current, voltage drop, leakage current, hysteresis, sensing range, repeatability, reverse polarity protection, and full short circuit protetion with automatic recovery all at the lowest prices in the market. It’s ext/triple sense models have the best sensing distance at the lowest prices. Where does it make sense? Standard sensing range models starting at $9.99 and ext/triple sense models starting at $24.99, EZ Prox with it’s unique LED visual light ring, is the best Inductive proximity sensor in the market. M30 long range non-flush EZ Prox with sensing range of 30 mm is an incredible value at a price of $34.99. Comparable models even from low cost suppliers cost twice as much with only 25 mm sensing range.